Hello lovelies, today I have for you a video answering a bunch of questions you sent through to me on Instagram. I picked my favourite questions but if I didn’t get to yours I’ll send you a message a message with my response. I really enjoyed putting this video together and sharing my thoughts on some of topics you had questions on. I’d love to hear what you think too one what I discussed! My next fabulous video will be up on Saturday! 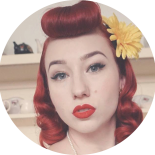 This entry was posted on March 28, 2019 by Miss Lady Lace in Videos, YouTube and tagged 1940's, 1950's, blogger, glamour, miss lady lace, miss lady laces pinup blog, perth, perth pinup, perth pinup blog, perth pinup community, pin up, pinup, pinup blog, pinup blogger, pinup fashion, pinup girl, pinup life, pinup lifestyle, pinup perth, red lips, retro blog, retro girl, retro glamour, the perth pinup community, victory rolls, vintage, vintage blog, vintage blogger, vintage fashion, vintage girl, vintage glamour, vintage perth, vintage pinup blog.